Author AJ Lauer: M is for Maisie Dobbs! M is for Maisie Dobbs! 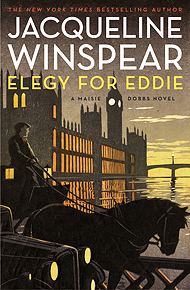 A book series that has become a love for me in the last year is the Maisie Dobbs series. They take place in post WWI England and follow Maisie, who is a Private Investigator. The newest book came out in March! Many of the stories involve people who are trying to process the impact of the Great War on their families and selves. The author deals with her characters' trauma and healing with great sensitivity. Maisie views each mystery as an opportunity to help people reconnect with themselves and those important to them, as well as an opportunity for her to learn about herself. I enjoy these books because rather than focusing only on the minute details of a murder or robbery, they focus on the human element and greater societal influences in the crimes. One of the things Maisie does that really resonates with me is her 'final accounting' at the end of a case. This is her habit of going back to visit places and people who were important to a case, in order to contemplate them with new perspective in the light of a solved mystery.